From now on, I will stop calling my food experiments "experiments" because when I call these as such, these sound hazardous to the health! :-) Instead, I will call these Freestyle. More adventurous and catchy, don't you think? Cook pasta as per package directions. Drain and cool. Heat up pan over medium heat. 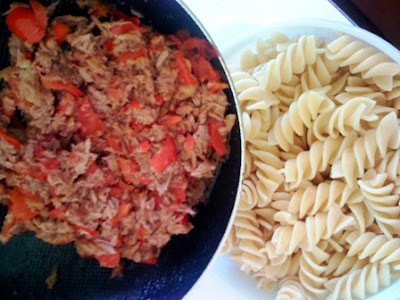 Pour oil from canned tuna onto pan. Bad move! The oil sputtered and splattered all over the stove surface before it calmed down when I add the chopped garlic in. Cook the garlic for about a minute. 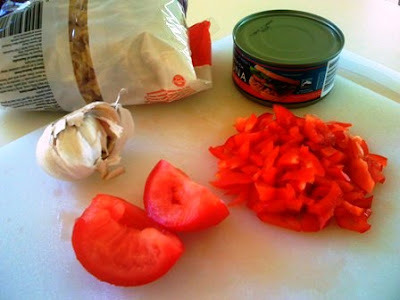 Then toss in the tomatoes, followed by the capsicum a short while later. Plop the tuna into the pan and mix it up. Remove from the fire after a couple more minutes. 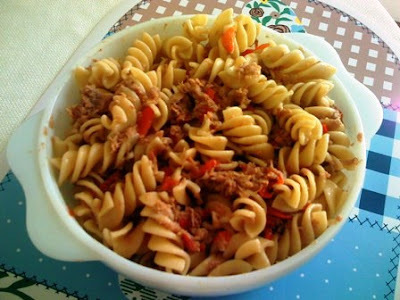 Pour tuna mixture over the pasta and mix it up. Very easy, isn't it? I thought it tasted nice. I would have added bits of basil but we still did not have the plant when I cooked the pasta. At least, I still have the remaining 250g left for another freestyle! unetableforfour: thanks for dropping by my blog! Hope you like my freestyle recipe!